Evernote’s latest update to hit the App Store brings two great features to the iPad: drawing and multitasking. iPad Pro and Apple Pencil support were also added, but I couldn’t quite test that yet, for lack of all the necessary hardware. I’ll just have to take their word for it. Evernote now plays nicely with other split-screen apps on iOS 9, so I can have it loaded alongside Safari or Mail for taking notes. This is a very big deal and is really changing the way I use the app across my iPad. I like keeping Evernote as my active Slide Over app, so that I can swipe left from any screen and quickly access or search my notes. This feels comparable to having a desktop-level widget on iOS, and I can only imagine how cool it would be to have Evernote open full-time on an iPad Pro. Pad & Quill organises your notes in classic notebooks kept on a wooden shelf. It’s intuitive, simple and beautiful. Inspired by the Italian bonded leather cases made by Pad & Quill, the app turns your device into books you will truly love. 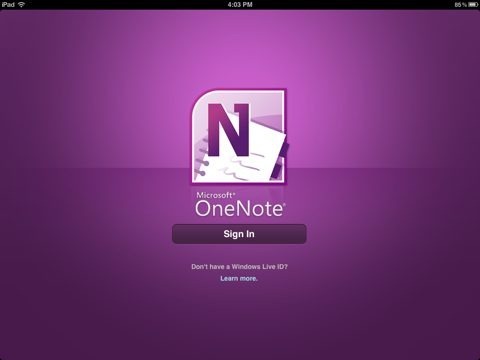 Microsoft OneNote for iPad hit the iPad App Store yesterday. There’s been an iPhone version of the popular OneNote note taking app for some time now, and now it’s got a big brother on the iPad. 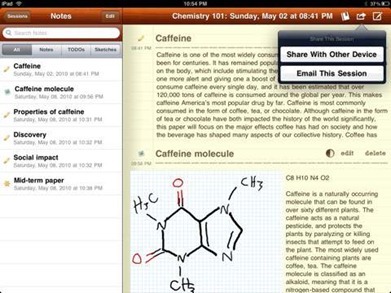 Create searchable notes with text, pictures and bullets. Make and manage to-do lists with checkboxes. Then keep your notes in sync using free Microsoft SkyDrive® online storage to access, edit and manage them from virtually anywhere, from your PC or almost any web browser. Access your notes online at http://skydrive.com. The app requires a (free) Windows Live ID to sign in with. 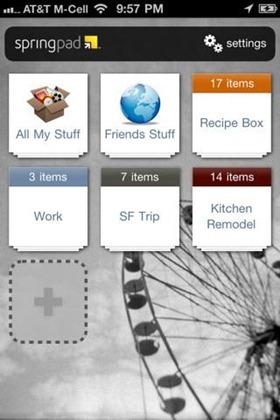 You can use an existing one or setup a new one from within the app. It also requires iOS 4.3 or higher. It opens notebooks created in OneNote 2010 or the OneNote web app. — Simplenote was for a long while my favorite notes app for actually writing and editing notes on iPad and iPhone – because of its clean, simple UI. It also has a pretty nice web app that it syncs to automatically. — Then my friend and writing colleague Thomas introduced me to Plain Text. Right now, it has replaced Simplenote as my favorite app to take notes in on the iPad. It syncs with Dropbox and I’ve been using Byword to edit notes made in Plain Text on the Mac. — Evernote is the most powerful and feature-rich notes app I’ve used on iOS. I have never enjoyed it’s UI when writing / editing notes on the iPad or iPhone, but it is available via any browser, has a very solid Mac desktop app, and is always my default place to store notes that I want to keep around and have access to months or years down the road. The latest update to the excellent Evernote app for iPad and iPhone adds a new Snapshot Notes feature for use on the iPad 2. So while you’re editing a note, or in fact as soon as you create a new note, you can snap a picture with either of the iPad 2’s cameras and have it instantly added to your note. Like most users, I cant imagine ever thinking of the iPad 2 as a top choice for taking photos – but as the Evernote Blog points out in their post on the update, it may well come in handy for a quick snap of a whiteboard in a meeting or similar scenarios. Here’s an App Store link for Evernote; it’s a universal app and it’s free. 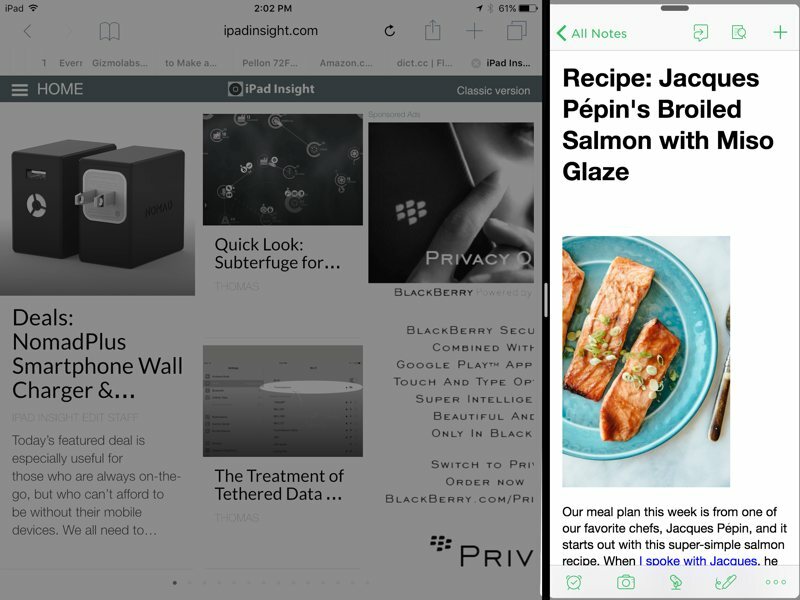 Evernote – the powerful and feature-rich notes app for iOS – got a huge update yesterday. Nearly all of it was directed at the iPhone version, even though it’s a universal app. So the iPhone version has had a massive UI overhaul. And it looks miles better. It now has a far more attractive home page, a dedicated search page, and some great ‘resource views’ to see attachments, images in notes, tags, and maps of where notes were made. The only thing that, sadly has not improved much is the actual note editing interface. Evernote for iPad got numerous behind-the-scenes improvements as part of this update. You can expect many of the ideas and concepts from this iPhone redesign to make their way into upcoming versions of Evernote for iPad. Stay tuned. Springpad recently reached the one million user milestone and is said to be growing even faster than Evernote. It looks like quite a capable app, and I installed it last night to give it a whirl. Here’s an App Store link for Springpad. It’s a free app. Writepad for iPad – one of the more versatile and powerful iPad note-taking apps – has had another update this week, to Version 4.5 (or in fact now to 4.5.1 by the time of writing). The two big additions in V 4.5 are a Palm Rest feature that lets users rest their hands while in handwriting mode, and the ability to export documents to PDF. Improved printing and new graphics are the other notable changes. CourseNotes – the popular and well-reviewed note-taking app for students – is on sale for the remainder of this week at just $2.99. That’s down from its standard price of $4.99. 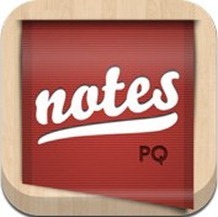 You can find CourseNotes, at its current sale price, in the App Store now. Simplenote – one of the leading notes apps for the iOS platform for a long while – has just had a huge update last night, to Version 3.0.2. As its name would suggest, one of Simplenote’s strongpoints has always been its simple and elegant look and UI. With this new update, the app has managed to maintain that simple, elegant quality while adding a substantial amount of functionality and some lovely bells and whistles as well. 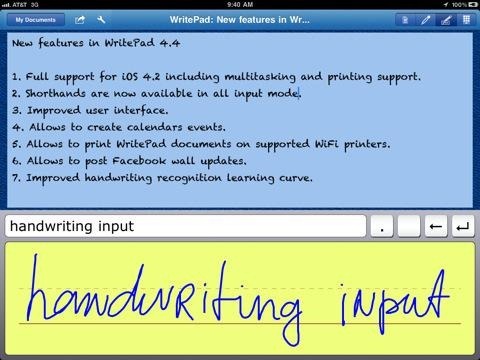 Writepad for iPad – the iPad note taking app that converts handwriting into text – has been recently updated, to Version 4.2. The big new feature is Dropbox sync. As I’ve mentioned before, I am a huge fan of Dropbox (for online file sync and backup), so it is always a big plus for me to see this feature added to any app. Writepad is an interesting app – one I’ve kept around on my iPad and always intend to use more. 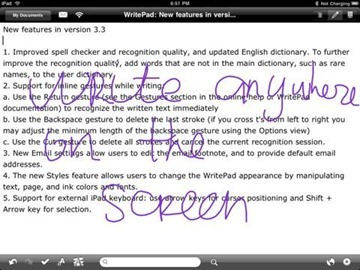 Its handwriting recognition – via fingers or stylus – is pretty good, though a little hard to get used to. If I ever get over that hurdle, it may become a much more frequently used app for me. 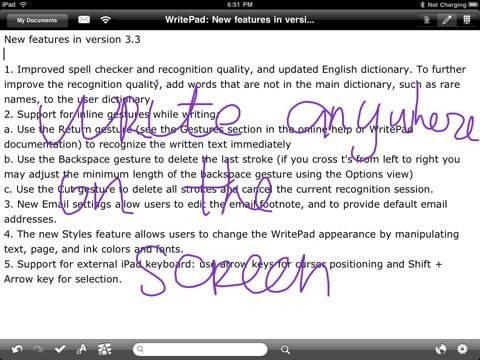 You can find this latest version of Writepad for iPad in the App Store now, priced at $9.99. Subscribe to iPad Insight's newsletter. I consent having to provide email address to ipad insight for future news, promotions email. Tips and Tricks: Did You Know Siri’s Voice and Language Settings are Separate? We love getting emails from readers and visitors. Feel free to contact us with any feedback, questions, suggestions, or simply to say hello! Tip Us: Send us your iPad news, scoops, tips and tricks! Got iPad Apps? Sponsor your iPad APP! © Copyright 2017 iPad Insight | All Rights Reserved. iPad Insight is an independent website and has not been authorized, sponsored, or otherwise approved by Apple. iPad, iPhone & iPod Touch are trademarks of Apple Inc.